This unique shower curtain is clear 100% vinyl made of 10 gage. There are anti-rust grommets for the hooks and shower curtain to hang. This is easier to clean than most shower curtains are and work great with as a liner with shower curtains for decor assistance making your bathroom look beautiful. Measurements are 72 inches by 72 inches. The rings that are made of anti-rust are also stain resistant. The curtain cleans very easily by wiping down with a damp cloth. Not only can you pair up a curtain with this to make great new looking bathroom decor, but you can also apply window or wall decals to the outside to your own likings for decorating for a child’s bathroom. 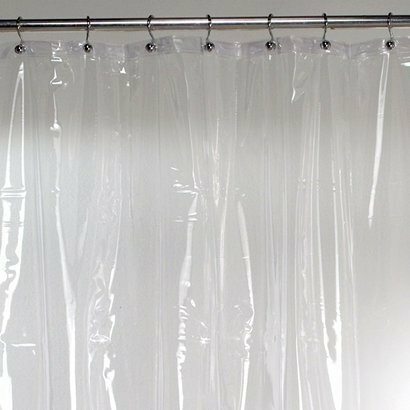 This is an Epica Antibacterial Mildew-Resistant Shower Curtain Liner.